Hrvoje Njiric gained acknowledgement in the 90's with projects developed by the former njiric+njiric partnership. The schemes for Europan (3 first prizes) and Slovenian projects for Baumaxx and McDonald's were widely published and awarded. The new practice evolved from and continued the work of the former office. njiric+ regards architecture to be much more than a physical definition of its boundaries or a formal assemblage of building materials. It's non-physical aspects are about phenomena of contemporary society and mass culture. Urban studies were undertaken extensively throughout the 90's and significantly less in the last decade, due to the collapse of public realm in Croatia. The exemplary nature of the projects is derived from the necessity to tackle different issues and to push them to the limits. Working on the projects outside Croatia is a chance to offer new answers to the same questions – mainly in housing domain, tourism and territorial operations. Regarding design work, we pursue three different approaches – upgrading schemes, moderate inventions and visionary projects. Current housing designs – Gracani (2006) and Rural Mat (2007) are based on the critique of an overproduction of dwellings in the post-war Croatia, lacking necessary substance and promoting subversive lifestyles and typologies. The efforts of the office should be regarded in such a context of upgrading, efficiency, modesty and everydayness. 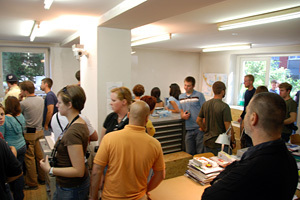 Social public buildings, such as kindergartens, schools, libraries and faculties are the second major concern of the office. In a numerous competition entries we are investigating these typologies and shifting their limitations toward moderate inventions. Besides the kindergarten MB (2007), chances are that three of them will be built – the city library in Rijeka (GKR 2005-), the law faculty in Split (Palazzo Bolognese 2008-) and the university library in Zadar (2009-). Visionary projects are the essential part of our practice. Based on facts and defined by circumstances, various concepts of a non-utopian character are developed in order to question the constraints of the current production in architecture. The major ones – „Yokohama Burning“ and „Twisted Schinkel“ originate from the 90's, but we are motivated to continue taking risks in the 10's, as already we did with the (za)breg 2012 project. HNJ believes that public space is the architect's major responsibility. 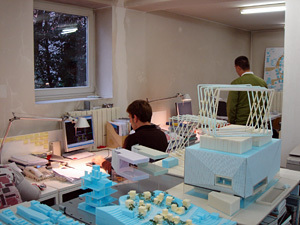 Various urban schemes developed in the office are based on that position, such as the City Campus (Rijeka 2003), „(R)urban Clusters“ (Zagreb 2006) and the University Campus (Zadar 2009), University Campus (Zagreb 2011) and Delta (Rijeka 2013). The MTV's Jackass punchline - „do not try this at home“ presents well our understanding of international projects as a chance to try out something else, something we would not do in Croatia, for a number of reasons. A variety of contextual demands often inspires us to search for a different approach. The projects for Russia, Japan, Italy, Scotland, Holland, Germany, Spain, Slovenia, Austria, Sweden and foremost the actual ones, which are likely to be built in Portugal and China, are a valuable experience for us. 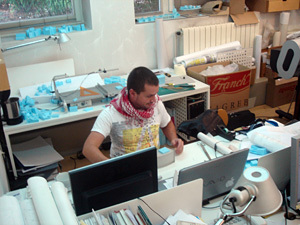 The practice includes 3 to 12 people depending on the very immediate work flow. We strongly believe that above certain size it is very difficult to maintain quality. The design and management of each project is led by HNJ and the project architect in a close cooperation with the client. The conceptual framework is sometimes concieved with the help of artists and other related professions, as we regard contemporary art to be much more operative than the current architecture itself. Working process includes landscape designers, environmental engineers and other specialists, depending on the profile of the project. The work of our practice has been extensively published in national and international press, recently in numerous architectural websites as well. The 90's projects have been a subject of the monograph by the El Croquis #114 - „metabalcanico“. A recent 2G monograph of the practice for the period 2000-2010 is available from May 2011. 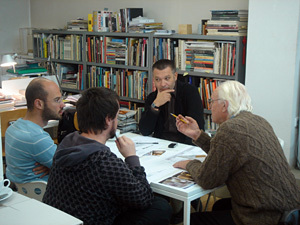 Hrvoje Njiric has been engaged in teaching since the mid 90's. He served as a full-time professor at the TU Graz (2000-05) as a successor of Guenter Domenig. Now he is a tenured professor at the GAFS Split (2007-) He has been a guest professor in other schools such as Ljubljana, Ferrara, Aarhus and Trieste. Recent guest professorships include ETSAM Madrid (2008-13), UofT Toronto - appointed as "The Frank Gehry Chair for 2012 and the MIT Boston in 2014. HNJ was the visiting critic at the HAB Weimar, the ETSAB Barcelona, the TU Wien, the AA School of Architecture London, the ETH Zuerich, the Strathclyde University of Glasgow, Politecnico di Milano, the Southeast University of Nanjing and the William Lyon Somerville Visiting Lecturer at the University of Calgary. HNJ has also been a unit master of various international workshops and lectured in many cities worldwide. The work of the practice has been the subject of various collective exhibitions as well. As a jury member HNJ participated in the international competitions in Austria, Spain, Slovenia, Germany, Romania,Italy and Switzerland. The new projects of the practice are not so intensively published as the old ones, due to our decreasing interest in the PR frenzy. Nevertheless, the recent success – three nominations and one shortlisted project in the „best 40“ for the Mies Award 09 has brought renewed international recognition to the office.